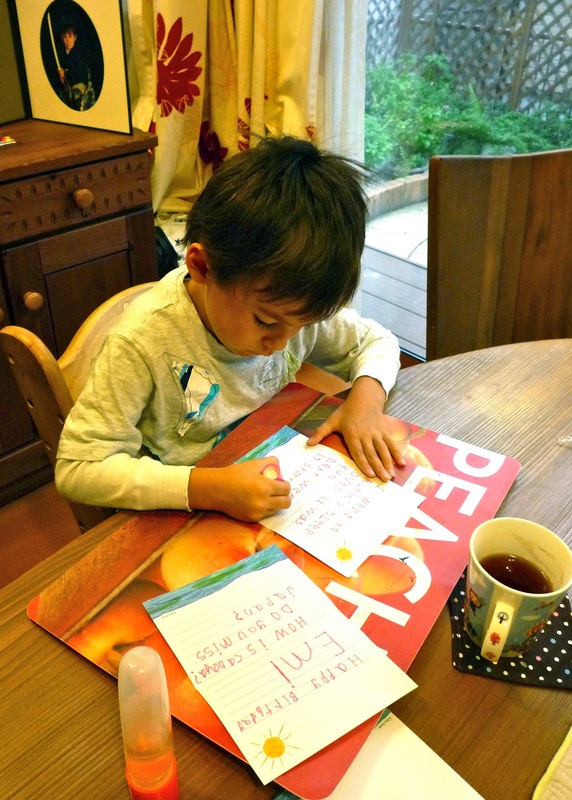 Yesterday I reminded Ebi-kun that it was one of his friends birthday soon, instead of making a card he decided to write her a letter using things form the letter writing box. He worked away, writing the letter, occasionally asking me how to spell something, he decorated it all with stickers and wrote the address on the envelope and put on the stamps, other than the odd spelling help I didn't do anything! This morning Daddy offered to drop the letter in the postbox on the way to work, Ebi-kun looked mortified and declared that he would do it, it was his letter! We have a letter writing box too and it is the only way I can get wingnut to even try to write.